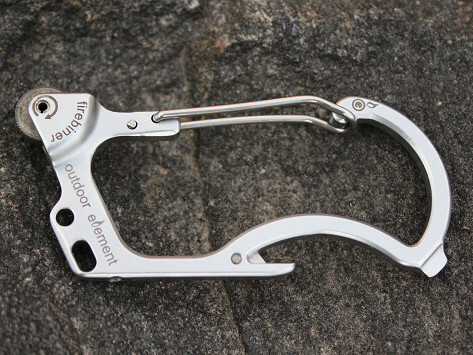 You’d never suspect this slim survival carabiner has six tools packed into it. We were especially intrigued by its low-profile fire starter. Just swipe your finger on the wheel to get a spark. 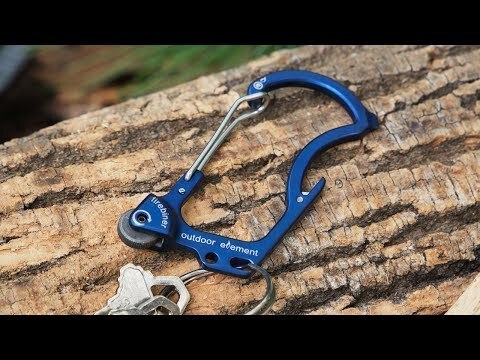 This carabiner also has a bottle opener, utility blade (perfect for cutting through fishing rod or thread), a screw driver, hanging slots, and extra ferro rods for when you run out of fire ammo. Weight rated for up to 100 lbs. Dimensions: 3" x 1.5" x 0.44"
Gift for my daughter’s boyfriend. He is an avid hiker and loves to fly fish. He was thrilled with this gift. Great little product to have on hand. This survival carabiner has a whole lot of functionality packed into a single ounce. Outdoor Element's carabiner is equipped with a screw driver tip, a bottle opener, slots to hang your keys, a blade that cuts through fishing line or thread, and—our favorite feature—a flint lighter. You’d never guess that a spark can come out of this slim multi-tool. But when you swipe your finger, a small piece of ferrocerium rubs on a harder, sharper material to create a spark. Use it for camping, your backyard fire pit, or for showing off (we were so fascinated with the flint wheel that it was a favorite fidget tool in the office). When your fire starter needs replacing, whether from lots of fires or just showing off the cool capability, it comes equipped with extra ferro rods. You don’t need to be a hiker, fisher, or even an avid outdoorsman to find it helpful. This carabiner is the type of tool that’s convenient for everyday life.